Google Chrome uses internal pages to display data to the user. Some of these pages are openly accessible, like the settings page or the extensions manager, while others are not. Most pages can only be accessed if you load the local address in the browser's address bar. This is for instance the case for chrome://flags, a page displaying experimental features that users can enable in the browser. While it is certainly possible to open those pages manually, it may not be the most comfortable option and not always possible, as you need to know about a page first before you can open it. 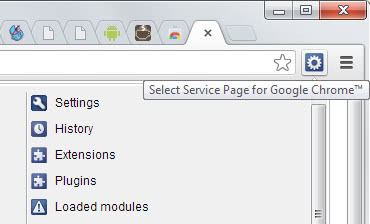 The Google Chrome extension Service Pages for Google Chrome adds a single button to the browser's address bar that links to all known local pages of the browser. This provides you with two advantages: first, you get a list of all internal pages including those that you may not yet know about. It offers 40 or so links which makes it likely that you will find new pages here that you may find useful. Second, all pages are two clicks away from being loaded in the browser. You may have to scroll down though due to the sheer size of different pages listed by the extension. The extension provides you with two options to edit the listing. You can change the default font size in which entries are displayed in the menu. If you make the font smaller, more entries are displayed at the same time on the screen so that you need to scroll less. Your second option is to disable pages that you have no interest in so that you end up with a selection of important pages only that are displayed directly in the menu. There is unfortunately no option to reorder the list to move the most important links to the top of the listing. Still, by disabling unneeded pages you may end up with ten or maybe even twenty that you can access from here directly. The extension displays all primary pages, settings, history or extensions, at the top followed by specialized pages afterwards. You will also notice that the extension adds a couple of entries to the browser's right-click content menu. Those become available after the next restart. Reload tab, window and all windows. Close tab, window and all windows. The extension has been designed for developers but it can be useful for all users who want better control of Chrome's internal pages. While I'd really like to see a sorting option, it is convenient to open all internal pages of the browser with a couple of mouse clicks. Display all internal pages of the Google Chrome browser in the web browser so that you can access them easily whenever the need arises.